(Nanowerk Spotlight) Low energy density is a main challenge for batteries and capacitors. Researchers are constantly developing new materials to increase the energy density of electrochemical energy storage devices. This approach, however, increases energy density by very limited amounts. An alternative approach is to extend the life of batteries and capacitors by integrating energy conversion technologies together with the energy storage units so that they become self-chargeable. Recently, lots of integrated/joint systems have been reported that can harvest energy from the surrounding environment – including natural sources of solar, thermal, wind energies and mechanical energy of human movements – to compensate for energy consumption in energy storage devices. For example, solar cells and nanogenerators are integrated into batteries and capacitors. However, these harvested energies possess a density highly dependent on the usage scenario. For example, solar cells can work well under intense sunlight irradiation but most of the time the users have only indoor lighting available. Similarly, nanogenerators can only collect ambient mechanical energy at sports mode, while most people need to stay quietly to work. Therefore, it would be highly advantageous to have an energy harvesting technology or system which possesses low dependency on environment and usage scenario. 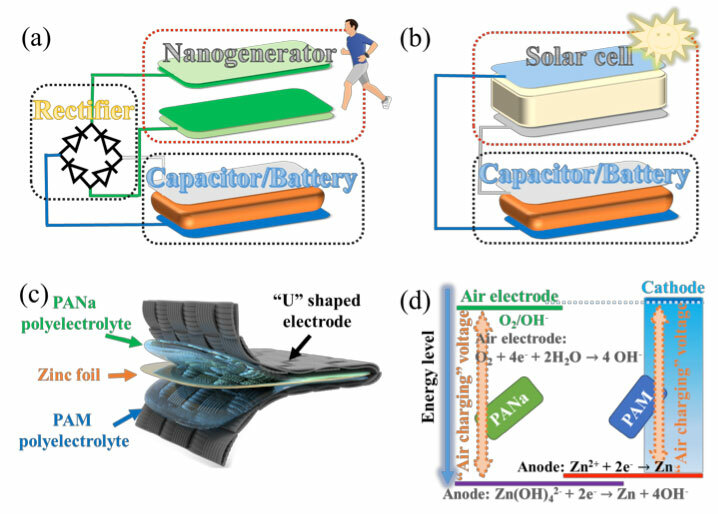 We propose a highly integrated system of an 'air charging' zinc-ion capacitor/battery. By scavenging energy from pervasive air, a zinc-ion capacitor/battery can be conveniently and easily charged without applying an additional power source. The team reported their findings in Advanced Energy Materials ("A Usage Scenario Independent “Air Chargeable” Flexible Zinc Ion Energy Storage Device"). The system possesses a simply structure that consists of a flexible bifunctional U-shaped electrode (with the dual function of energy harvesting and storage), a zinc-metal electrode in middle, and two different polyelectrolytes (PAM and PANa) sandwiched between the metal zinc and the electrode. The concept of the design is that when the working unit is exhausted and no external power supplier is available, the self-charging zinc-air component is triggered, which can charge the working unit to provide additional battery life. When external power is available, the whole system can be fully recovered. When the device is exposed to air atmosphere, a reduction reaction of O2 + 4e- → 4 OH- and an oxidation reaction of Zn + 4OH- → Zn(OH)42- + 2e- occur on one side containing PANa hydrogel, leading to higher potential of half “U” shaped electrode and lower potential of zinc metal electrode. The voltage gap drives the adsorption of ions on the cathode and Zn2+ deposition on the anode of the zinc-ion capacitor, respectively. The charged voltage is equal to the potential gap between the oxidation and reduction reaction, ∼1.66 V, when the air electrode is exposed to air. When the zinc-ion capacitor is exhausted, it can be quickly charged to 88% within 10 minutes with only a simple operation of opening the sealing tape and letting the air diffuse in. The capacitor exhausting 'air charging' processes are repeated 60 times and the whole system works well. When an external power supply becomes available, both the zinc-ion capacitor and the air-charging component can be fully recovered. The next stages in the team's investigations will extend this design and concept to other electrochemical energy storage systems like the widely used Li-ion batteries, K-ion batteries, Na-ion batteries, Al-ion batteries and so on.